Ever wonder what type of fish swim in the East River, or which species of trees dot the perimeter of the adjacent Brooklyn Bridge Park? 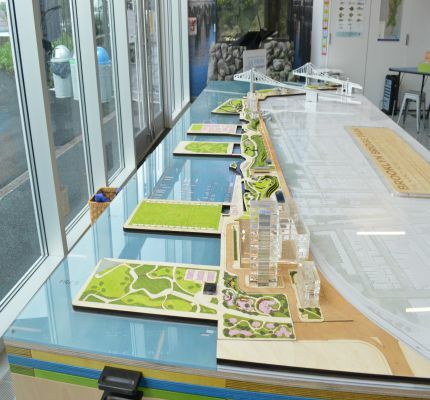 The recently opened Environmental Education Center, which sits under the Manhattan Bridge along the Dumbo waterfront, will answer these questions and more for NYC kids and adults who can explore hands-on exhibits during FREE drop-in hours or sign up for a paid STEM-inspired class to learn all about the ecology and history of the surrounding waterfront habitat. And yep, this family spot is hosting both weekend and weekday drop-in hours! The stunning Environmental Education Center, located in the Main Street park section of the Brooklyn Bridge Park, just across from the famed Jane's Carousel, was built from a refurbished park building to offer a permanent home for the Brooklyn Bridge Park Conservancy’s educational programming operations. An entire side of the building is made up of glass, offering breathtaking views of the Brooklyn Bridge and the Manhattan skyline. The centerpiece upon entering the single classroom is the Nancy Bowe Discovery station, which features a 3D model of the entire park with interactive drawers that kids can pull out to reveal information about the park’s sustainable design and animal and plant life. There are tutorials on oyster restoration, bridge forces, East River fish, caissons and salt marshes. An interactive rendering of the nearby parkland, piers, bridges and buildings. Kids, including toddlers to big kids, will dig the touch tank. 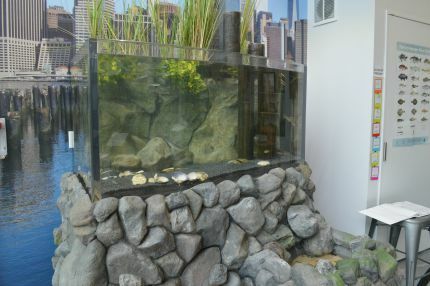 The 250-gallon aquarium contains fish and other wildlife caught from the East River as part of the organization's seasonal seining, an educational catch-and-release program. Children can hold and touch different rocks, marine plants, shells and animals like starfish at the small rock pool in front of the aquarium. Kids can handle local starfish, shells, plants and rocks at the touch tank. A number of smaller stations arranged throughout the room offer kids other fun ways to learn about the featured theme. For example, they can look through a microscope at water samples, touch and examine all kinds of seashells or cozy up in the reading corner with books about fish, rivers and other sea creatures. While some of the exhibits like the microscope are better suited to older children, the center will likely appeal to preschoolers on up to fifth graders. You can drop in to the center at 99 Plymouth Street for FREE on weekends or during the week, but the opening hours are a bit limited right now: 1-4pm on Saturdays and Sundays; and 3-5pm on Thursdays. For the budding biologist, try out one of the center's (~$100) classes for elementary and middle school students, such as “The Awesome Oyster,” “Great Brooklyn Bridge,” “Trees of Brooklyn Bridge Park” and “Weather on the Water.” After-school options are available, too. Photo by Alexa Hoyer/courtesy Brooklyn Bridge Park Conservancy. Check its website to confirm drop-in hours and times as the schedule is subject to change. The bathroom does include a changing table. Strollers must be left outdoors. No food or drink is permitted inside. The class schedule is available on the website. Private tours for special occasions like birthdays are available on Saturday and Sunday mornings. Contact ephillips@brooklynbridgepark.org for details. Looking for more to do in the area? We've put together a list of all the great things to do in Brooklyn Bridge Park with kids, and you can always grab a post-lesson treat at One Girl Cookies around the block. 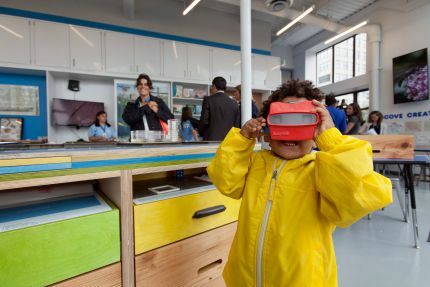 Top image of kids at the new center by Alexa Hoyer/courtesy Brooklyn Bridge Park Conservancy.